That’s why they changed their UI (user interface) to make it easier for folks to binge on content rather than chips – or maybe. a good chance you’ll binge the two together. Not to get all shrinkish on you, but it’s all part of hedonic adaptation people follow in their never-ending search for happiness or at least a break from the seeming monotony/chaos of the world around us. And thanks to the growing internet penetration, faster internet speeds and dramatic shift to consuming entertainment online, it’s becoming easier to cut–or at least pare back–the appointment viewing cable and replace it with anywhere, anytime, any device OTT (over the top) viewing. It is so satisfying that more and more firms rush to offer new/better streaming bundles since global OTT subscriptions are expected to grow 24 percent this year. Nearly 765 million people worldwide tune in to watch their content on platforms such as Netflix and Amazon Prime. 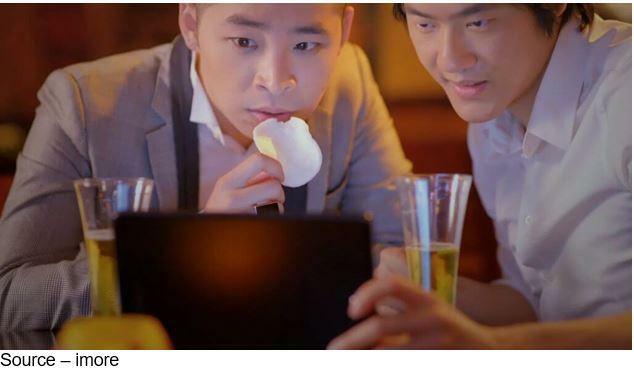 Go Together – Nothing goes with a great movie, TV show, documentary, mini series or soccer game like a smooth video stream to a clean, crisp screen (no matter what its size) and a fist full of potato chips or other munchies. Next to fat foods, OTT content bundles are rapidly becoming a major export for the U.S., according to Zenith Online Video forecast. They recently reported that globally, consumers spend 67 minutes a day watching online video. The consumption is steadily rising, and more folks want a piece of the financial pie … including Wal-Mart. Still, Netflix bundle users account for nearly 44 percent of the global OTT subscription users. Growth is Growth – Netflix was dinged on their last quarterly report because they missed their guesstimate on new subscribers and didn’t meet financial analysts’ projections … gee! Australia has the highest Netflix usage in Asia Pacific and in the EU, Nordic and German consumers have found it to be the video of choice. To keep consumers coming back for more, Netflix is beefing up its local content and signing agreements that include unlimited streaming packages with telcos and cable services. Amazon’s Bezos and his team are also aggressively expanding their offering into as many international markets, and as quickly as possible, to chase OTT global video profits. While Netflix is usually the first name that comes to mind when people think of SVOD (subscription video on demand), it’s not as though they don’t have other competitors in the FAANG (Facebook, Amazon, Apple, Netflix, Google), BAT (Baidu, Alibaba, Tencent) and other regional services. 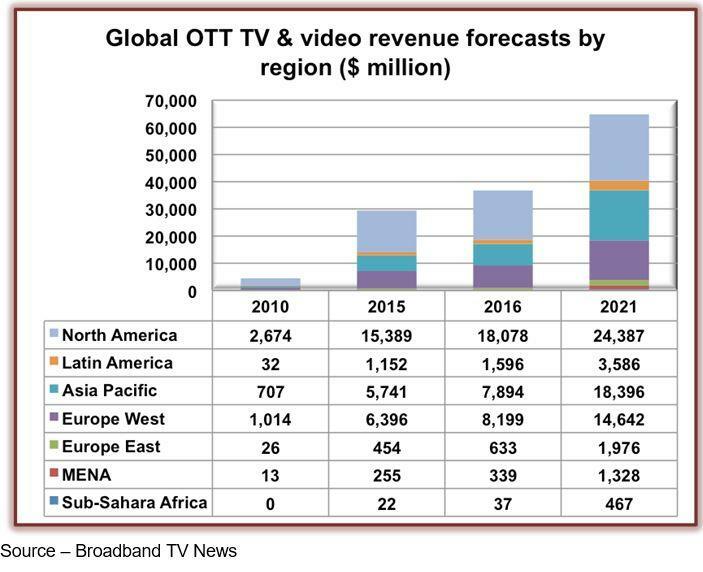 Money Images – OTT video and streaming content continue to grow steadily, while old-fashioned appointment/Pay-Tv continues to slide. And they all want their unfair share of the growing OTT sales. 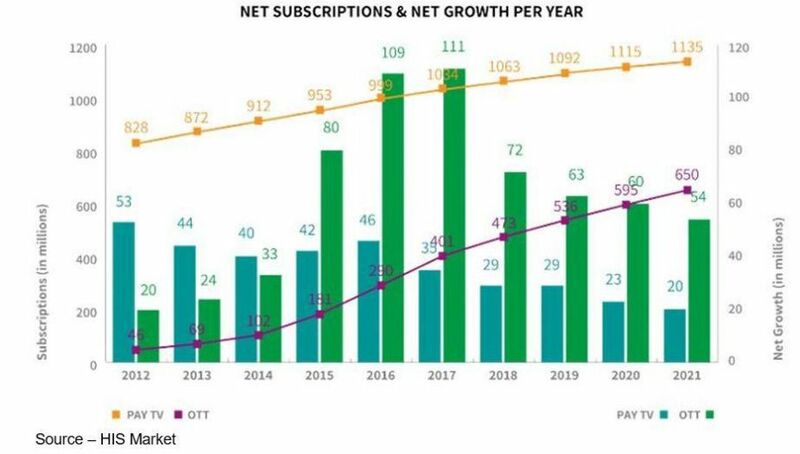 According to HIS Markit, Netflix, Hulu and Amazon Prime are adding more than three times the number of subscribers than POT (plain old TV), even though digital pay TV subscriptions (cable, satellite, IPTV) passed one billion last year. Allan McLennan, CEO of PADEM Media Group, noted that while pay TV is still growing, primarily because of China’s IPTV growth, OTT growth is surpassing pay TV subscriptions around the globe. As demand for content options grow McLennan said that virtual MVPDs (Multichannel video programming distributors) like Sling TV added more than 110M subscribers to their 200-plus viewers around the world. Traditional pay TV organizations have reduced churn by adding set-to-box functionality, exclusive content, on-demand services and new varieties of bundles. It seems like only yesterday Comcast was willing to bet almost anything to buy the film and TV assets of 21st Century Fox but decided the amount of debt they’d have to carry would be too steep, so they “let” Disney expand its entertainment empire for $71.3B. That makes Disney king of the hill when it comes to content assets as it prepares to launch its own channel bundle. Comcast turned its attention to buying Britain’s pay-TV company and video assets by upping its bid for Sky to $34B, topping Fox’s $32.1B. This followed on the heels of AT&T’s seemingly successful bid for Times Warner for $84.5B. Hey, a billion here, a billion there and pretty soon you’re talking about serious money; but it makes a lot of sense if they want to become major players in the high-risk, high-reward M&E industry. AT&T somehow convinced the court that they wanted to buy TW but really wanted them to operate as completely separate entities. You know, WarnerMedia, HBO, Turner would sign distribution deals with anyone … including AT&T’s competition. The new pipes boss was subtle in saying from now on it’s going to be quantity over quality and the rest of the content acquisition got the message. After all, AT&T wants to be more valuable to customers than a wired/wireless pipeline service. The real money for them is to offer content bundles that make it tougher for customers to switch providers; and yes, with each new enriched service offering, consumers will be faced with higher prices and fewer options. Yep, the good ol days will come back … count on it. And that, little girl, is also why Comcast wants Sky. The leading EU countries got great content deals – premium sports, HBO, Disney, Fox, so it can capture more OTT customers while old fashioned pay-TV subscriptions slip away. 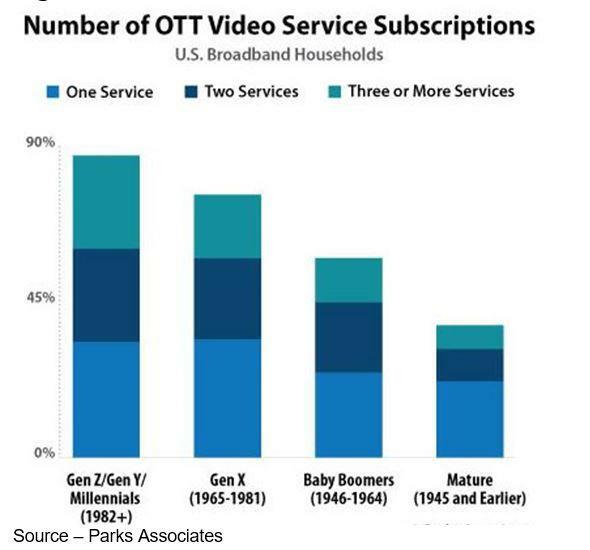 OK and Great – While conventional Pay-Tv is barely holding its subscriber numbers (good among boomers plus), OTT viewing on any screen continues strong, healthy growth. Sky is much more than a satellite content distributor in Comcast’s eyes, because the company believes it can attract strong media brands to distribute their content with the growing Sky/Comcast global network. We believe we see the method to their madness. In our family, streaming is natural–especially with the kids who never knew life that wasn’t online. Growing Habit – Consumers, especially pre-millennials; feel that watching the content they want, when they want it, where they want it is the natural order of life today. Today, kids are constantly on YouTube, Instagram, Snapchat, and other social media/video sites as well as hopping between Netflix, Amazon Prime, Hulu, and well, you get the picture. It seems that every time they hear about another new hot streaming service, they ask to sign up. They’ve already put their request in for Disney’s channel and it isn’t even here … yet. And still, they have the nerve to say there’s nothing on … get a life, kid! New services keep emerging and expanding globally, which is why YouTube may be onto something with their new “explore” tab to check out stuff you’ll probably be interested in, may be interested or didn’t even have a clue existed … we’ll see. More than One – Once consumers cut or shave the TV cord for a streaming service like Netflix, they quickly find that the one channel doesn’t deliver all the content they want so they add another service or two or more. Folks are already beginning to complain about having to go from one app to another on their smartphone, tablet and smart TV to find just the entertainment they want right now. Sure, the cost of adding “new” channels/apps are starting to add up, but convenience is again becoming a major concern again; which is probably why Roku, with it’s single point of entry to a fantastic array of ad-supported and paid viewing, has grown so rapidly and profitably. Padem’s McLennan told us that a few months ago when Verizon brought in Ericsson’s Hans Vestberg as CEO last month. Best Aggregator – While the money always looks better on the other side of the table, being an outstanding delivery service and content creator/producer requires vastly different talents. But in the consumers’ eyes, you need them both. With no exclusive inside information except for a fantastic understanding of where the industry has been and needs to go and a solid network of content and infrastructure folks, he was certain Verizon was going to first focus on building out and strengthening its infrastructure. According to their latest earning report, it looks like a very smart move. They’ve been expanding their IoT services, building out their 5G network infrastructure around the globe and adding fiber network services in addition to digging deep into network-based video analytics and advertising services. McLennan explained that for their in-home residential bandwidth, they’re using 5G to fixed homes/office and suggested they’ll be aggressively rolling out mobile 5G services next year. McLennan sees Verizon rolling out 5G services based on their technological expertise, asset base, engineering talent and global spectrum portfolio. “Sure, they want to be a major consumer video provider,” he said, “but they’re taking a much longer view of the complete marketplace which includes smart cities, transportation, education, healthcare, etc., as well as OTT TV. “Those other areas will be much more profitable and will have to be much more reliable than the consumer OTT viewing, which will be very attractive to the content channels and consumers,” McLennan added. I really dislike it when he’s right, but the rumors are that Verizon is already deep in video delivery discussions with Apple, Google and a number of other content-rich providers. I’m pretty sure China Telecom, Deutsch Telekom, Orange, BK, Rogers are taking a look at the company’s results/focus and readjusting their plans as well. After all, kids are pretty fickle when it comes to the shows they watch and how they switch allegiances … even when it comes to Netflix, Amazon and YouTube. Looking at the Lay’s Potato Chip bag … you really want ‘em all!